This week, we conducted the “Descent Observation” operation (DO-S01) from 3/6 to 3/8 in order to observe a future touchdown candidate site (S01) in detail. This was the first descent to an altitude of 22m since the 2/22 touchdown. In the first half of the week, we adjusted the pressure of the RCS (thrusters) and found them to be in good condition. 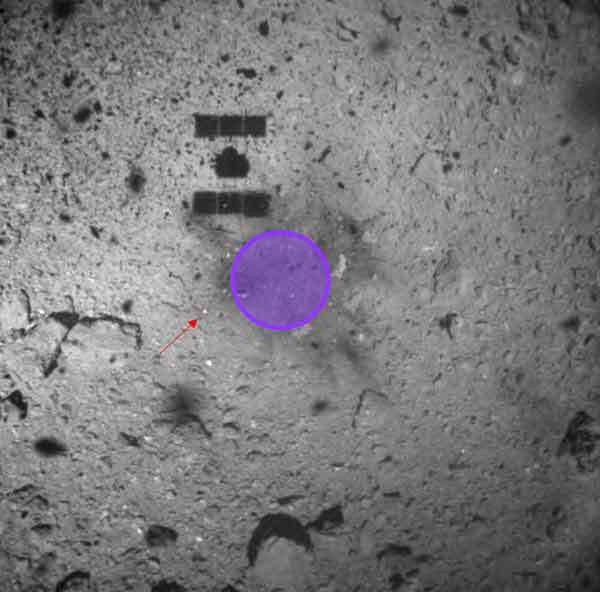 As the Optical Navigation Camera (ONC-W1) appeared to be dusty from the previous touchdown, we did not know if there would be any issues during this descent with the camera or other instruments that we would have to deal with. Luckily, all devices worked normally and we obtained detailed data of S01. The spacecraft returned to the home poison on 3/9 and we are now preparing for the next “crater search” operation (CRA1). Immediately after returning to the “home position” at a 20km altitude after the TD1-L08E operation on 2/23, we began a BOX-C operation in which the spacecraft descends to an altitude of about 5km. As one of the observations in this this operation, we observed around the Otohime boulder. We also downloaded the data obtained by the last touchdown operation (TD1-L08E) and from this BOX-C operation, as well as checking the health of the bus equipment for next week’s “Descent Observation” operation (DO-S01). We had many days of bad weather, and the operation time at the Usuda station was shortened due to wet snow in a late winter. Despite this, we managed many operations in a short time. The spacecraft began to rise back towards the home position on 3/1.